The southern hemisphere's largest ever Windpod system has been installed on the City of Cockburn's administration building in Spearwood, as part of a joint research trial with Windpods International. Twenty Windpod turbines have been installed on the building – facing south-west to harvest the most wind – and are expected to generate 4.5 megawatt hours of power each year. 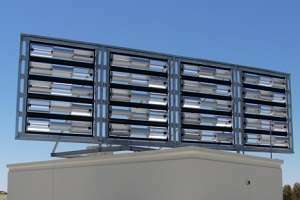 It follows their first commercial installation on the roof of the City of Fremantle's council chambers in 2009, after early development was conducted in and around Fremantle and the University of WA's wind tunnel. Originally invented by Fremantle resident Graeme Attey, Windpods are small-scale, drum-style wind turbines designed to suit urban environments. "Wind turbines work by converting the kinetic energy in the wind into mechanical power and Windpods use this power to drive a generator situated at the end of each turbine," City of Cockburn climate change officer Jennifer Harrison says. "The electricity from the generator is fed through a cable to an inverter that converts the energy from DC to AC electricity which can be used by the building. "Windpods produce lower noise and vibration than conventional style wind turbines and are efficient in turbulent environments, such as on and near buildings." Each Windpod turbine is divided into three sections with two longitudinal aerodynamic blades in each section and is encased in an outer frame, which makes the structure easier to see and safer for birds. They can be installed vertically, horizontally or at any angle in between—in the City of Cockburn's case, they have been installed horizontally in four banks, supported in a purpose-built steel frame. "Each Windpod is 0.5kW, providing 10kW of electricity combined, which is equivalent to about 60 photovoltaic panels," Ms Harrison says. Cockburn Mayor Logan K. Howlett says the Windpod system on the council's administration building added to the 13 per cent of renewable energy already being generated for another two buildings on the same site. "Energy monitoring equipment has been installed and the city is collecting data that will add to its growing wealth of knowledge about sustainability," he says. "Our investments in renewable energy were formally recognised in 2012 with our city topping the list for sustainability across the nation [Australia's Most Sustainable City]." The Windpods are the latest addition to the City of Cockburn renewable energy program, joining a collection of 599 solar photovoltaic panels installed on 10 community buildings across the Cockburn area. If the information is correct, this installation is hideously inefficient. Even with the rosy assumption of 20 years of efficient use, the installation generates just $7,200 over a lifetime at coal fired parity (8c per kilowatt hour.) $360 per pod. Assuming just 200kg each of steel, the raw steel production accounts for 10% of the CO2 savings. Fabrication, transport and decommissioning would be at least another 10% and this is being optimistic.All the whole exercise does is make some Greenies feel good. Remember, the money spent on the fixtures(which would have to be more than $360 per pod) could have been spent on other stuff.